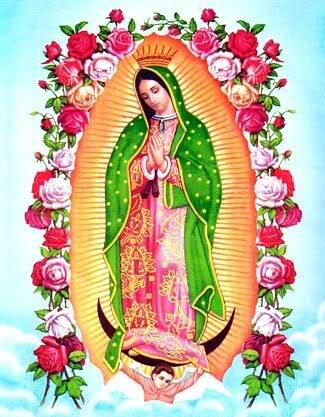 In honor of many upcoming holidays this December, there is one orignally from México coming up this friday that holds special meaning in Catholicism and is also very symbolic in the town of Guadalupe, México. Our Lady of Guadalupe ( also known as the Virgin of Guadalupe) represents the title of the Vigin Mary whose image is continuosly celebrated in the Bascillica of Our Lady of Guadalupe in México City, one of the most visited catholic sites in the world today! On the morning of December 9, 1531 Juan Diego was on his way to mass when he saw symbol of a a maiden at the Hill of Tepayec, in what would become the town of Guadalupe in the suburbs of Mexico City. Speaking to him in the native language, the maiden asked that a church be built at that site in her honor; from her words, Juan Diego recognized the maiden as the Virgin Mary. Diego recounted the events to the Archbishop of Mexico City, Fray Juan de Zumarraga who instructed him to return to Tepeyac Hill, and ask the “lady” for a miraculous sign to prove her identity. The first sign was the Virgin healing Juan’s uncle. The Virgin told Juan Diego to gather flowers from the top of Tepeyac Hill, where he found castillian roses, not native to Mexico, blooming in December on the normally barren hilltop. The Virgin arranged the flowers in his tilma or cloak, and when Juan Diego opened his cloak before Bishop Zumárraga on December 12, the flowers fell to the floor, and on the fabric was the image of the Virgin of Guadalupe. On December 12, this tradtion continues to play a significicant role in faith and healing and is celebrated all over North and Central America. For more information about Our Lady of Guadalupe, please visit www.sancta.org.